Interior of the Doopsgezinde Kerk, Alkmaar, 1960. Photo by G. Th. Delemarre, Rijksdienst voor het Cultureel Erfgoed. Alkmaar is a town in the Dutch province of North Holland, with a population of 94,000 in 2005. Shortly after 1530 Alkmaar and the vicinity were already a center of Anabaptist activity. In 1533 two women from here were taken prisoner and put to death on 5 February 1534, in the Hague. There must have been an active and a rather large circle of Anabaptists, many of whom were put to death in the course of time. Most of these victims were under Münsterite influence. Slowly the congregation came to more peaceful principles. Leenaert Bouwens baptized no less than 123 persons here between 1551 and 1578. It is not certain that Menno visited the Alkmaar congregation. At the siege of Alkmaar by the Spaniards in 1573 the Mennonites aided the magistrates in defending the town, but were exempt from bearing arms. At the end of the sixteenth century there were three congregations, a Frisian, a Flemish and a Waterlander. The last one was the largest. Their preacher was the well-known Hans de Ries, who began his service here in 1597 or 1598. This congregation held its services in a barn at the Koningsweg (enlarged in 1617) on the site of the present Mennonite church. The Flemish, whose history is almost unknown, united with the Waterlanders in 1674. The Frisians built a simple barn-church in the Ridderstraat in 1616 (remodeled in 1682). From 1738 there was close cooperation between the Ridderstraat and the Koningsweg congregations, although they were independent. The Frisian congregation belonged to the Frisian Sociëteit and also to the Zonist Societeit, and the Waterlander congregation belonged to the Rijper (Waterlander) Sociëteit. In 1738 Martin Schagen was called as preacher of both congregations, and henceforth the two congregations had only one pastor. In 1809 the congregations decided on a full union, and the building in the Ridderstraat was sold. 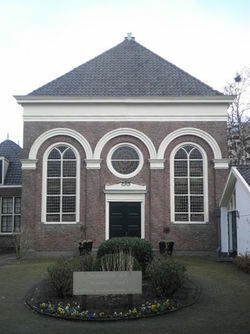 This was due in part to the size of the congregations, both being small (in 1807 Ridderstraat had about 40 members, Koningsweg about 70) and not wealthy. 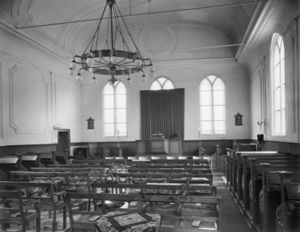 The church at the Koningsweg was used by French soldiers in 1795-1797; thereby many old archive papers and books were lost. The church was remodeled in the nineteenth century; an organ was added in 1819. The congregation, which numbered 105 members (other sources say 98 members in November 1809) on 1 January 1809 (when the union took place), had 240 in 1876. During the first half of the twentieth century the number of members rose steadily: in 1898, 469; in 1951, 756. The membership in 2006 was 185. Since the union in 1738 the congregation was served by the following ministers: Martin Schagen, 1738-1741; Rogerus Buitenpost, 1741-1747; Jan de Bleyker, 1747-1783; Jan ten Kate, 1783-1798; Jacobus David Vissering, 1798-1809; Daniel Ysenbeek, 1809-1855; Pieter Bruyn, 1855-1862; Hermanus de Boer, 1863-1897; Pieter Jacob Glasz, 1898-1910; Herman Westra, 1911-1932; Frederik Kuiper, 1932-1945; Arend Jan van der Sluis beginning in 1946. 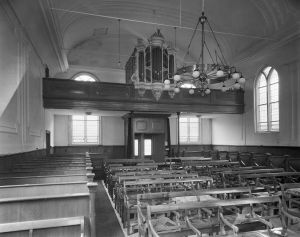 In the congregation there were for many years organizations for the women, the men (Broederkring), and the young people, a members' club called "Hans de Ries," which arranged for evening meetings, visits the, sick, etc., and a choir. A children's church was maintained in cooperation with the Nederlandse Protestanten Bond. There was also a children's Sunday school. Doopsgezinde Bijdragen (1880, 1882, 1883, 1891, 1909). Hoop Scheffer, Jacob Gijsbert de. Inventaris der Archiefstukken berustende bij de Vereenigde Doopsgezinde Gemeente to Amsterdam, 2 vols. Amsterdam: Uitgegeven en ten geschenke aangeboden door den Kerkeraad dier Gemeente, 1883-1884: v. II, 1455-1469; II a, 4-8. Zijpp, Nanne van der. "Alkmaar (Noord Holland, Netherlands)." Global Anabaptist Mennonite Encyclopedia Online. 1955. Web. 22 Apr 2019. http://gameo.org/index.php?title=Alkmaar_(Noord_Holland,_Netherlands)&oldid=126095. Zijpp, Nanne van der. (1955). Alkmaar (Noord Holland, Netherlands). Global Anabaptist Mennonite Encyclopedia Online. Retrieved 22 April 2019, from http://gameo.org/index.php?title=Alkmaar_(Noord_Holland,_Netherlands)&oldid=126095. This page was last modified on 12 October 2014, at 00:58.